State government budget deficits in Kansas, North Carolina, and New Jersey are “huge,” because their Republican governors have cut tax rates. Cutting tax rates invariably leads to lower tax revenues. The federal deficit is “plummeting,” because President Obama raised taxes on the wealthiest Americans. 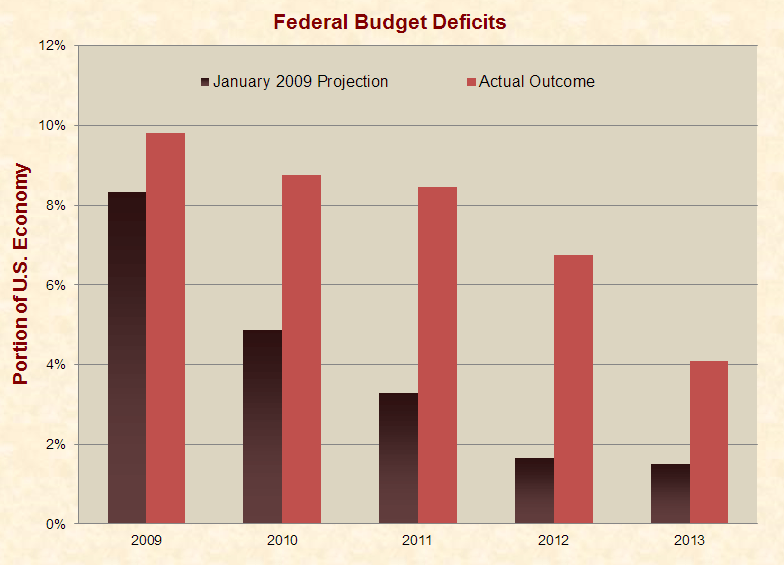 The federal deficit she applauded is 4.8 to 6.7 times larger than the state shortfalls she derided. 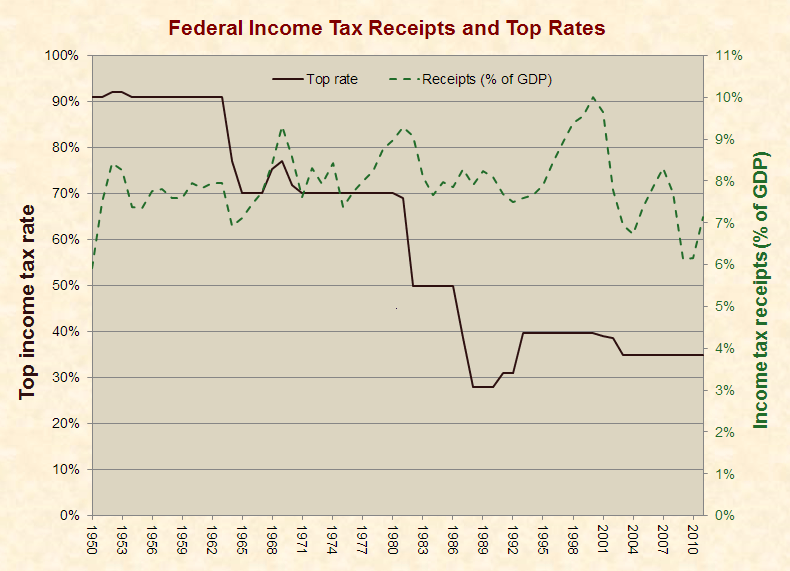 Tax revenues sometimes stay level and even increase when tax rates are cut. Below is the documentation of these facts, along with the details of how Maddow has distorted the truth. However, compared to the size of their budgets, the projected budget shortfalls of these states are far smaller than that of the federal government. The projected 2014 fiscal year shortfall for Kanas is 3.0% of the budget—for Jersey, it is 3.0%—and for North Carolina, it is 2.2%. 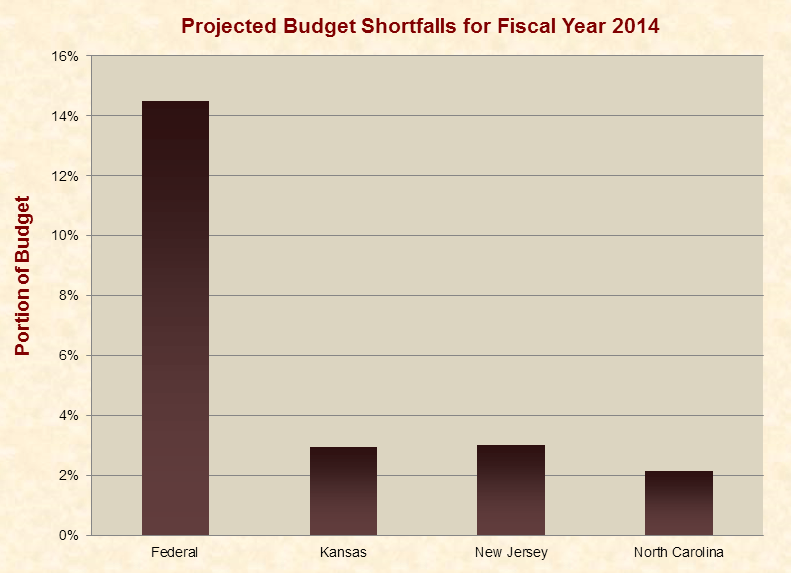 In comparison, the projected shortfall for the federal government is 14.5% of the budget. In other words, the federal deficit that Maddow celebrated is 4.8 to 6.7 times larger than the state shortfalls she decried. Throughout the segment, Maddow repeatedly used sarcasm to assert that reductions in tax rates inevitably produce lower tax revenues. In her words: “One thing that happens when you cut taxes is that taxes get cut!” That claim may seem intuitive, but it is not true in all cases. The reason that tax revenues don’t always mirror tax rates is because there are a host of other variables that affect revenues, one of which is that lower tax rates boost people’s incentives to work, thereby generating more taxable income. Any income tax system will tax away part of the gain an individual gets by moving up the income scale, reducing the incentive to earn more. But a progressive tax takes away a larger share of the gain than a proportional tax, creating a more adverse effect on incentives. Just two weeks before President Obama was inaugurated in January 2009, CBO projected the path of the U.S. economy and federal budget for the next 10 years based upon current law. These projections showed rapidly improving economic conditions coupled with rapidly declining budget deficits after 2009, as is typical after a recession. In the words of Krugman, “rapid growth is normal when an economy is bouncing back from a deep slump.” Economic growth, in turn, boosts tax revenues and lessens spending on government assistance programs, all of which serves to shrink deficits. Nevertheless, Obama and supporters like Maddow routinely crow about the declining deficit, using the refrain that it has fallen at the fastest pace since World War II. What they neglect to mention is that every deficit from 2009 to 2012 was larger than any deficit since the World War II era. Thus, there was enormous potential and natural impetus for the deficit to fall. Yet, even in 2013, four years after the recession ended, the deficit was still 72% higher than the average deficits that occurred solely during the presidency of George W. Bush (without overlap with Clinton or Obama). Obama denounced these Bush-era deficits on the floor of the U.S. Senate in 2006 when he stated that “reckless fiscal policies” had driven federal deficits to “historically high levels.” Now, he and others are bragging about deficits that are significantly worse. On the day Obama gave that speech, the national debt was $8.3 trillion or 61% of the nation’s economy. The national debt now stands at $17.5 trillion or 102% of the economy. Hence, even after adjusting for economic growth (which accounts for population increases and inflation), our national debt is now 67% larger than the debt Obama railed against in 2006. Finally, linking deficits to any particular president or governor fails to account for the actions ofcongresses, the impacts of preexisting laws, and many other variables that impact government spending and revenues. Hence, to attribute these deficits purely to presidents or governors, as Maddow and many others have done, oversimplifies and misrepresents the facts of these matters.